Alupar Investimento S.A. is a national private holding company with operations in the electricity generation and transmission segment, which controls several companies in Brazil and is also present in Colombia and Peru. Alupar’s purpose is to implement and operate infrastructure projects related to the energy sector in Brazil and other selected countries in Latin America which present economic, institutional and regulatory stability. Alupar is one of the leading companies in Brazil in terms of Annual Permitted Revenue (RAP) and the largest 100% privately owned company. 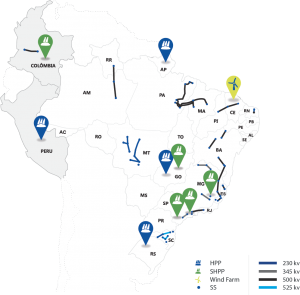 Alupar maintains 29 transmission concession, totaling 7,736 km of transmission lines, in Brazil with a term of 30 years and one lifetime in Colombia. Since 2005 Alupar has operated in the generation segment with hydroelectric power plants (HPP), small hydroelectric power plants (SHPP) and wind farms with a joint installed capacity of 687.0 MW, 580.0MW of which from 3 HPPs, 4 SHPPs and 1 wind farm complex in operation. The 107.0 MW under implementation refer to hydroelectric generation projects. The Company seeks to maximize shareholder returns through moderate financial leverage and debt profile compatible with the low risk of the Company’s business, characterized by predictable revenue and strong operating cash flow in the generation and transmission segments. Alupar’s corporate credit ratings reflect this solid capital structure and the predictability of its strong cash flow: AAA (bra) in the national scale and BB in the international scale, by Fitch Ratings. Committed to create value to the shareholders and society, Alupar has technical excellence, strong financial discipline and social responsibility to continue growing in a sustainable manner through the development of transmission systems and generation projects.